While scenic beauty is world-wide, three countries have been chosen in which to examine the development of national interest in scenic beauty: Britain, United States and Australia. A summary of international initiatives is also included together with references. Britain has a long and proud history of appreciating the beauty of its landscapes. British writers, poets, painters, photographers and the ordinary tourist have a love of their landscapes and have learned to appreciate and protect them (Whyte, 2015). The earliest books on landscape were written by geologists, explaining the geological reasons for the landscape’s appearance. These include: Geikie, A., 1901. The Scenery of Scotland Viewed in Connection with its Physical Geology. MacMillan; Lord Avebury, 1906, The Scenery of England and the Causes to Which it is Due. MacMillan; Stamp, L.D., 1946. Britain’s Structure and Scenery, Collins. “The natural beauty is inexhaustible. And it is not only inexhaustible: it positively increases and multiplies the more we see of it and the more of us see it. So it has a good claim to be considered the most valuable characteristic of the Earth” (Younghusband, 1920). In 1926, the Council for the Protection of Rural England was formed to safeguard the productivity and beauty of the countryside and to protect it from urban intrusion. The organization is now named the Campaign to Protect Rural England (cpre.org.uk). “The combination of the English village, with the setting of field and hedgerow and coppice, is an Arcadian scene unrivalled elsewhere in Great Britain and unsurpassed in any part of the world” (Cornish, 1934). Cornish’s books on landscape included: The Poetic Impression of Natural Scenery, 1931, The Scenery of England, 1932, Scenery and the Sense of Sight, 1935, The Preservation of our Scenery, 1937, The Scenery of Sidmouth, 1940, and The Beauties of Scenery, a Geographical Survey, 1943. The inter-war period was very significant for shaping the English national identity, in particular, linking it with the rural landscape (Brace, 2003). Books describing English rural life, landscapes and villages were exceedingly popular during this time, selling in their hundreds of thousands (Figure 1). The books “naturalized a version of rural England in which timelessness and continuity were powerful recurring motifs” (Brace, 2003). Figure 1 Charles Bradley Ford’s The Landscape of England, B.T. Batsford, 1933. The Addison Committee on National Parks (1931) was established in 1929 to assess “if it is desirable and feasible to establish” National Parks in Great Britain. In 1931 following hearing from witnesses and taking evidence, it reported favorably about their establishment, their purpose including “to improve the means of access for pedestrians to areas of natural beauty.” Unfortunately, the Great Depression and World War II intervened to prevent progress. However, the Town and Country Planning Act 1932 gave local councils power to preserve scenic amenity. In 1942, the Scott Report on rural land use recommended the establishment of national parks for the enjoyment of the whole nation. The Committee reported that “the land of Britain should be both useful and beautiful and that the two aims are in no sense incompatible … it must be farmed if it is to retain these features which give it distinctive charm and character” (Selman & Swanwick, 2010). The inquiry resulted in the 1944 White Paper, The Control of Land Use, which proposed national parks as part of a comprehensive post-war plan. Landscape surveys of the coast and of the countryside were also completed during the war. The focus on landscape beauty during the wartime is striking, perhaps reflecting a deep psychological comfort associated with the character and perceived beauty of their country during the trauma and hardship of war. It also derived from the interest in the English countryside during the earlier pre-war period. In 1945, the Dower Report defined national parks as “an extensive area of beautiful and relatively wild country, in which, for the nation’s benefit and by appropriate National decision and action, the characteristic landscape beauty is strictly preserved…” Dower also proposed protection for areas of high landscape quality. Between 1951 and 1957, ten large tracts of private land were designated as national parks. The designation of national parks was based on their perceived natural beauty and recreational potential. Areas of Outstanding Natural Beauty (AONB) were also designated, generally smaller, less suitable for outdoor recreation, and lacking extensive areas of open countryside. The national parks were mainly highland landscapes, whereas AONBs covered farmed lowland landscapes. By 2016, the 15 national parks totalled 8748 sq miles (22,658 sq km), or 9.9% of the United Kingdom (none in Northern Ireland), and the 46 AONBs totalled 9,000 sq miles (23,301 sq km) or 18% of United Kingdom (none in Scotland). The parks and AONBs include about one-third of the coastline of England, Wales and Scotland (Figure 2). The system of national parks over private land and the designation of AONBs is a uniquely British solution to the competing desire to protect high-quality environments with the need to provide food and fiber for a large population. The early emphasis on landscape paralleled the experience in other countries. Scenic preservation, along with provision for public enjoyment of the parks, were the major initial reasons for the creation of national parks; concern for the protection of flora and fauna was a later factor. Scotland also has 40 National Scenic Areas covering 5322 sq miles (13,783 sq km) or 17.5% of Scotland. These cover beautiful scenery and include prominent landforms, coast, lochs, rivers, woodlands and moorlands. Meanwhile in 1947, the Town and Country Planning Act provided for the designation by councils of Areas of Great Landscape Value within council development plans. The first real attempt to move beyond mere descriptions of the British landscape and to analyze it more rigorously began with the work of David Lowenthal of the American Geographical Society and Hugh Prince from University College, London. In two seminal papers, The English Landscape (1964) and English Landscape Tastes (1965) they described the content of the English landscape and English landscape preferences. They identified variety, openness and atmosphere as key visual qualities of the English landscape and referred to it as “altogether so tamed, trimmed, and humanized as to give the impression of a vast ornamental farm, as if the whole of it had been designed for visual pleasure.” Components which epitomized the English landscape were the bucolic (pastoral), the picturesque, the deciduous, the tidy (i.e. order and neatness), façadism, antiquarianism (rejection of the present, the sensuous and the functional; having historical associations), and Alexander Pope’s genius loci – the spirit of the place. In the late 1960s, new quantitative approaches were developed by Fines (1968) in a survey of the East Sussex landscape (Figure 3), Linton (1968) of Scotland, and by Hebblethwaite of the East Hampshire AONB (Hampshire C.C. et al, 1968). Fines, 1968. Note: exponential scale 0 – 32. Similarly, Linton commenced his paper: “Scenery is a natural resource. Scenery that charms, thrills or inspires is a potential asset to the land in which it is found” (Linton, 1968). Both Fines and Linton regarded landscape quality as a national resource of vital importance to the country. More sophisticated and objective studies followed based on component measurement and statistical analysis, including the Coventry-Solihull-Warwickshire study (Study Team, 1971). In 1975, Jay Appleton, a geographer at the University of Hull, published The Experience of Landscape, a wonderfully written liturgy of landscape, which espoused his famous prospect -refuge theory to explain why people found particular landscapes beautiful (see theme: Landscape Theory). The Manchester study, a four-year research project undertaken by the Department of Town and County Planning at the University of Manchester (Robinson, et al, 1976) for the Countryside Commission was intended to recommend a standard approach for evaluate landscape quality for the Commission. The project examined techniques to evaluate the visual quality of landscapes and tested statistical techniques to assess visual quality. Because of its significance, it is summarized here. The Manchester study of landscape evaluation was carried out over four years (1970 – 74) by the Landscape Evaluation Project and directed by the University’s Department of Town and Country Planning. Seminars, consultancy reports and research studies were conducted. The Countryside Commission indicated its intention to prepare an advisory manual for planning authorities based on the report. The report commenced with a discussion of landscape – as land use, topography, eco-system, heritage and scenery. As a unifying concept, landscape embraces all of these and also serves as an art form for artists. The report then traced the development of interest in landscape in Britain from the 1930s Addison report through to the 1970s ecological approach. It examined the purposes and directions of landscape evaluation research. The report differentiated landscape character assessment from landscape quality evaluation: “It is important not to confuse the analysis of landscape character which is descriptive, and analysis of quality which is evaluative” (2.21). It also examined the economic value of landscape. The report examined aesthetic concepts, in particular, the nature of landscape beauty, and the influence of factors such as tastes, preferences and associations on one’s judgement about the landscape. It had a lengthy discussion of operational issues that affect evaluation: the concept of the view, classifying survey units (where it preferred grid squares), field assessments, and judgements of observers. It critiqued existing methods focusing, in particular, on the choice and number of observers, and the choice of scoring scales. It discussed the selection of landscape components, and the invalid conversion of ordinal scale scores into cardinal numbers – which can be statistically analyzed but require a base and equal intervals between numbers. Ordinal numbers are purely rankings without a base or equal intervals. It regarded this issue as the major problem of existing methods, all of which were “subject in varying degrees to technical errors and conceptual weaknesses.” It, therefore, proposed to concentrate on improving field-based methods and the statistical techniques to avoid the problem of ordinal numbers. Method 1. Field-based evaluation method. Survey all 1 km grid square survey units in the area by between 4 and 30 observers using a common scoring system with the results being a mean and distribution for each survey unit. A control square of fixed landscape quality would be selected, and the quality of all other survey units compared with this to provide a common base for the landscape scores. Method 2. Predictive evaluation method. Uses factor analysis of the independent data (i.e. physical characteristics) to select components and regression analysis (to assess the influence of the independent variables on the dependent variable – the landscape quality score) to determine their weights based on a sample of survey units and using the field method as in the first method; the weights can then be applied to the remaining survey units. The report detailed the method of each and their application. The reaction to the Manchester report by the Countryside Commission was underwhelming. According to the 1987 landscape guidance by the Commission, “Many techniques (especially the so-called statistical methods) fell into disrepute. Practitioners tended to despair of the subject and leave it to the academics.” Years later in 2002, Professor Carys Swanwick of the University of Sheffield identified the Manchester study as an exemplar of a “supposedly objective, scientific, often quantitative approach” which led “to a considerable degree of disillusionment with this type of work.” She went on, “This was largely because many believed it inappropriate to reduce something as complex, emotional and so intertwined with our culture, as landscape, to a series of numerical values and statistical formulae.” Many practitioners probably found the complex statistical methods too overwhelming technically to fully comprehend. Swanwick described the evolution of the approach (Table 1). She identified the Manchester-type study as landscape evaluation which identified “what made one area of landscape ‘better’ than another.” She asserted that during the 1980s the emphasis shifted to landscape assessment, which described why one area was different or distinct from another area rather than their relative value. The change appeared to mark an admission of failure to develop a commonly agreed method for valuing landscape quality, substituting in its place, a mere description of its character. The following caution by the Manchester Report appears to have fallen on deaf ears: “It is important not to confuse the analysis of landscape character, which is descriptive, and analysis of quality, which is evaluative”. Local landscape designations (LLDs) are widely used by councils to protect their landscapes, defined as “of at least county importance for reasons of their rarity, representativeness or variety” (Scott & Shannon, 2007). Areas of Great Landscape Value (AGLV) can be declared by councils under the T&CP Act, thereby restricting development in the area. Their name may be confused with Areas of Outstanding Natural Landscape (AONB). In the 1980s, there was continuing debate about the meaning of the phrase, outstanding natural beauty in the National Parks Act. An inquiry into the North Pennine s AONB in 1985 was presented with a statement from the Countryside Commission that the term in practice meant outstanding landscape quality as there were few areas in the country that were entirely natural (Selman & Swanwick, 2010). Paradoxically, it is difficult to define an outstanding landscape without some form of evaluation; a mere description of landscape character obviously would not suffice. The factors to be considered in reaching a judgement, however, were entirely descriptive. They included: relative relief, landscape shape, natural quality (or wildness), semi-natural vegetation, dramatic contrasts, remoteness, unspoiled quality, continuity and extent, harmony of the works of man and nature, and vernacular architecture. Quite a list, but no assessment of landscape quality. The North Pennines Inquiry found in favor of the term landscape quality in place of natural beauty, and stated that the quality of the landscape of the area is both natural and man-made. In accepting the findings, the Secretary of State said that “assessment of landscape quality necessarily involves a subjective assessment and that within the consensus of informed opinion allied with the trained eye, and commonsense, the matter is one of aesthetic taste” (Selman & Swanwick, 2010). 2002 Landscape Character Assessment: Guidance for England and Scotland. The Commission’s first guidance in 1987, Landscape Assessment: A Countryside Commission Approach, comprised a description of its physical characteristics and what distinguished the landscape from other landscapes, but not an assessment of its aesthetic value. The Commission adopted the Inquiry’s terminology in describing it as “a broad, multi-dimensional approach based on aesthetic taste operating within the context of informed opinion, the trained eye and common sense.” Figure 4 summarizes the method. In 1993, the Commission updated and expanded the advice into Landscape Assessment Guidance. The new guidance distinguished landscape types (e.g. chalk downs) from landscape areas (e.g. South Downs) which was a useful distinction. The guidance allowed for work at different scales with national or regional assessments providing the framework for more detailed assessments, again a useful contribution. It made explicit the criteria for designating landscapes, for example, for AONB status. By including non-visual factors such as history and wildlife; however, the guidance expanded landscape from a solely visual phenomenon. In 2002, the Countryside Agency revised its guidance on landscape character assessment. Landscape character was defined as ‘‘a distinct, recognizable and consistent pattern of elements that make one landscape different from another, rather than better or worse’’ (Swanwick, 2002), thus clearly differentiating it from qualitative evaluation. Previously, landscape was the visual appearance of the land, now it was a relationship between people and place; the interaction between the “natural (geology, soils, climate, flora and fauna) and cultural (historical and current impact of land use, settlement, enclosure and other human interventions).” It appears to becoming more and more like an environmental description rather than a landscape assessment. Figure 5 summarizes the 2002 method for defining landscape character. This is clearly far more sophisticated than the 1987 method. The 2002 guidance continued the division between landscape character assessment – the description of its physical character – from judgements about its landscape value. Another shift was that judgements about its landscape value were based on perception which varied from person to person. Its evaluation required local communities’ participation rather than expert assessments. Landscape was about people and place rather than scenic quality. The 2002 guidance defined landscape quality, not in value terms, but as the condition or physical state and intactness of the landscape, thus relegating it to mere description of the extent of landscape degradation rather than its aesthetic merit. Landscape integrity would have been a more accurate and less confusing term. Associations with particular people, artists, writers, or other media, or events in history. A field survey is an integral part of the guidance, and this includes a subjective assessment of aesthetic and perceptual aspects. Table 2 lists aspects that could be covered but emphasizes that the list is not exhaustive and surveyors are free to introduce their own words. The list originated from the 1987 guidance labeled the Subjective Checklist but unfortunately omitted several from the 1987 document – rarity, security, stimulus and pleasure, and changed variety to diversity. The checklist contained in Table 2 has the effect of rendering aesthetic judgement a cognitive analytical process rather than a product of affect, the likes and dislikes of the landscape. People had a range of places from nearby to distant. “naturalness‟ was a subjective term and both a well-trimmed hedgerow and a marshland habitat could be seen as natural. This study confirmed that “all landscapes matter,” which reflected a central tenet of the European Landscape Convention. In 1993, the Countryside Agency commenced a pilot program called the New Map of England, which aimed to identify, describe and analyze landscape types at a broad regional scale, and in 1996 produced the map. Figure 6 shows the latest iteration of the map (2014). It classified and described 159 character areas. Interestingly the word ‘landscape’ is diminished, it is termed the “Character of England map”, not the “Landscape Character of England map” although this is expressed in the explanatory text. In 2014, Natural England revised the National Character Area profiles to accord with the European Landscape Convention and other policies. Great Britain has a long and distinguished history of regard for its landscapes as evidenced by its poets, writers, painters and photographers. During the Second World War, Britain drew strength from the appeal and constancy of its rural landscapes. Through the twentieth century much was written to describe and delight in its landscapes and much action was taken, via the establishment of national parks, AONBs and through planning policies, to safeguard its landscapes from deleterious developments. From the late 1960s onwards, planners started to develop methods to measure and map the quality and features of the landscape. Quite sophisticated quantitative methods were developed and had they been further refined, there is much they could have achieved. However, it was not to be. For reasons best known to itself, the Countryside Commission (and its successors) with the statutory responsibility for Britain’s landscapes, retreated from evaluating landscape value (or quality) to describing and classifying it by maps of landscape character. Fear of being accused of subjectivity may have been the underlying reason for the agency’s reticence. The new approach was devoid (as far as humanly possible) of subjective judgement. Curiously although the criteria for designating AONBs included scenic quality, no guidance was provided on how to evaluate this. Scenic quality was largely obscured through the additional considerations, all of which could be measured and mapped. The meaning of the term landscape has shifted from referring to the beauty of the land to a relationship between people and the land and covered every conceivable natural and cultural aspect as well as all five human senses. This evades its qualitative values and instead provides a footing for the focus on landscape character, a neutral and objective field to explore compared with the subjective field of landscape quality. And as if to add insult to injury, landscape quality no longer refers to the qualitative value of the landscape but to its condition and whether it needs repair! This is far removed from the community’s view of what landscape and landscape quality comprises. In Britain, landscape has digressed far from its original meaning, spurred by an aversion to subjectively valuing landscape quality and by the demands to integrate landscape with other consideration. It is a sad state that Britain can no longer refer to the beauty of its landscapes but rather to a landscape in prime condition! In contrast to Britain, the drive to establish national parks was driven largely by concerns about scenic preservation. The loss in 1913 of Hetch Hetchy Valley in Yosemite National Park for a dam to provide water for San Francisco spurred the preservationists to gain wider recognition of the scenic attractions of the national parks. Arguing against the utilitarians who wanted to use the water, timber and other resources of these “waste” areas, the scenic preservationists led by John Muir argued that scenery also brings dollars. In 1910, there were some 20 distinct organizations directly advocating scenic protection. Alliances were struck between the park authorities and railroad companies to provide better access to the parks. In the 1870s, the Northern Pacific railroad company endorsed scenic protection, not for altruistic reasons but rather to promote tourism and patronage of their lines. The railways promoted the parks and built grand rustic hotels in them for their passengers to stay. In the post-World War 1 era, private automobiles gradually overtook the railroads as the preferred means of travel, expanding access to the parks. While the inter-war years saw the use of automobiles confined largely to the wealthier, following World War 2 the automobile moved from a luxury to a necessity. An early activist for national parks was Dr. Horace McFarland, a businessman, who, in 1908, addressed a Conference of Governors called by President Theodore Roosevelt to address measures for the conservation of the nation’s natural resources. He urged the conservation of scenery, saying: “The scenic value of all the national domain yet remaining should be jealously guarded as a distinctly important natural resource, and not as a mere incidental increment” (Runte, 1979). In 1910, Allen Chamberlain, a New England advocate, wrote an article, “Scenery as a National Asset”; to quote: “Let it not be forgotten that Switzerland regards its scenery as a money-producing asset to the extent of some two hundred million dollars annually” (Runte, 1979). He and others argued that Americans should first see the beauties that America had to offer before spending their money overseas, thus combining patriotism, aesthetics and economics. Chamberlain’s figures were cited in the Senate in arguments for the Glacier National Park in 1910. In Congressional debate in 1915, Edward Taylor argued that Switzerland gained between $10,000 and $40,000 per square mile of scenery per year and that America stood to gain much more. In 1912, President William Taft recommended to Congress the establishment of a Bureau of National Parks for: “the proper management of those wondrous manifestations of nature, so startling and so beautiful that everyone recognizes the obligations of the Government to preserve them for the edification and recreation of the people.” In 1916, President Woodrow Wilson established the National Park Service within the Interior Department. Several national parks were established prior to the NPS including the first at Yellowstone in 1872, and later the Yosemite and Sequoia National Parks. The National Park system in 2016 covered 410 areas covering 130,500 miles2 (338,000 km2) (Figure 7). In addition to the 59 national parks, the system includes national monuments, military sites and battlefields, national cemeteries, historic sites, seashores, rivers and parkways. Scenic appreciation serious and self-conscious – landscapes improved and signposted. In a whimsical paper “You’ll Love the Rockies,” an Englishman, J.A. Walter (1983), recounted his impressions of the American landscape, contrasting it with that of England and the Continent. He found the vast scale of the American landscape daunting, yet the high position of the sun actually served to flatten the landscape compared with the low sun in England that emphasized the smallest undulation. The forest trees of America he found boring and frustrating in that they block the view – yet Americans obviously loved them. In contrast to European landscapes that comprise a delicate balance of forest and village, mountain and meadow, he found American landscapes comprising vivid contrasts – rock spire and desert, ice-clad volcano and forest. The American landscape comprises large-scale examples of pure landscapes – all desert, all forest, all mountain ranges, each of enormous extent, in contrast to the incredible variety apparent in English and European landscapes in small areas. Numerous books have chronicled the origins of American’s love-hate relationship with the environment, and the landscape in particular including: Christopher Tunnard & Boris Pushkarev, 1963. Man-made America: Chaos or Control? Stewart Udall, 1964. The Quiet Crisis; Ian Nairn, 1965, The American Landscape: A Critical View. The beauty of our land is a natural resource. Its preservation is linked to the inner prosperity of the human spirit. The tradition of our past is equal to today’s threat to that beauty. Our land will be attractive tomorrow only if we organize for action and rebuild and reclaim the beauty we inherited. Our stewardship will be judged by the foresight with which we carry out these programs. We must rescue our cities and countryside from blight with the same purpose and vigor with which, in other areas, we moved to save the forests and the soil. Included in the message were ambitious proposals to beautify rural and urban landscapes, mined areas, rivers and the nation’s highways, to remove billboards and automobile junkyards along the highways and clean up pollution of air and water (presidency.ucsb.edu/ws). J.B. Jackson was skeptical about the likelihood of anything permanent resulting from the program. He said that, in a country where “whatever is old is obsolete, and whatever is obsolete is discarded” the wonder of the American landscape is not that it contained such mess, but that it also contained so many attractive suburbs and towns (Jackson 1965). In May, 1965, the President convened the White House Conference on Natural Beauty (Beauty for America, 1965) to stir the nation to action. The 1964 Wilderness Act created the National Wilderness Preservation System which now protects 762 areas totalling 170,180 miles2 (440,770 km2) (2016) of Federally owned land across 44 states, 4.5% of the United States (Figure 8). Sec. 2. (a) In order to assure that an increasing population, accompanied by expanding settlement and growing mechanization, does not occupy and modify all areas within the United States and its possessions, leaving no lands designated for preservation and protection in their natural condition, it is hereby declared to be the policy of the Congress to secure for the American people of present and future generations the benefits of an enduring resource of wilderness. In 1964, Congress authorized the Ozark National Scenic Riverways. This foreshadowed the Wild and Scenic Rivers Act 1968, which now protects the free-flowing condition of 208 rivers totaling 12,680 miles (20,453 km) in 2016. Scenic river areas were defined as rivers that are free of impoundments, with shorelines or watersheds still largely primitive and shorelines largely undeveloped, but accessible in places by roads. However, there are more than 75,000 large dams, which have modified almost 17% of US rivers. Americans being wedded to cars, it is not surprising that it established the National Scenic Byways Program in 1991 based on the outstanding scenic, natural, historical, cultural, archaeological, and recreational qualities of its highways (Figure 9). Scenic is taken far beyond vistas to include neon landscapes, history, and native arts and culture. Byways are designated by the US Secretary of Transportation and cover 120 National Scenic Byways plus 31 All-American Roads, located in 46 States (2016). In addition, the US Forest Service has designated 137 National Forest Scenic Byways covering nearly 9,300 miles (15,000 km) of roads in National Forests. The US Forest Service manages 155 national forests totaling 485,000 (780,000 sq km) in area or 8% of the United States. National Forests can comprise as much as 40% of an individual state. “…introducing greater variation in corridor edges and in the shape, size, and distribution of clearcuts can help to emulate patterns found in the natural landscape…current landscape management emphasizes the visual, stylized design of an ideal nature…” (Gobster, 1996). In 1995, the VMS was replaced by the Scenery Management System. The main differences with the new guidance were a greater role for constituents throughout the process, and its integration with ecosystem management and with other biological, physical, social and cultural resources. The system continues to be applied by the Forest Service. The Scenery Management System was defined as an overall framework for the orderly inventory, analysis, and management of scenery. The system applies to every acre of National Forests and National Grasslands administered by the Forest Service and to all Forest Service activities including timber harvesting, road building, stream, range, and wildlife improvements, special use developments, utility line construction, recreation developments, and fuels management. Figure 10 summarizes the Scenery Management System. The basic mapping unit is the ecological unit and together with the land use is used to describe the landscape character, its identifiable character. This provides the basis for describing its scenic attractiveness within a particular landscape character. Three classes of scenic attractiveness are used: A – distinctive, B – typical, and C – indistinctive, and within each of the landforms, land cover, water and cultural features reflecting varying visual perception attributes of variety, unity, vividness, intactness, coherence, mystery, uniqueness, harmony, balance, and pattern. They are described in terms of the formalist characteristics of line, form, color, texture and composition. The attractiveness classes are mapped. A Scenic Class rating is assigned from 1 to 7, which indicate the scenic importance of each landscape area. The constituent information component allows for the inclusion of perception-based assessment of visual landscape quality. This provides a check of the results of the assessment. Daniel (2001) described the Scenery Management System as a comprehensive management system, the success of which relies very substantially on the skill and judgement of the landscape architect conducting the assessment. The system is an example of the Formal Aesthetic Model which analyzes landscapes on the basis of their formal qualities. Its longevity, solid research base and the operational environment in which it is applied ensures that the system is among the most sophisticated tools for analyzing and managing landscapes. In recent years, the Scenery Management System has aimed to integrate scenic aesthetics with ecosystem management principles as a step towards an ecological aesthetic approach (Sheppard, 2001). Several key researchers of landscape aesthetics have worked in the Forest Service, including Ron Boster, Paul Gobster, Herbert Schroeder and Elwood Shafer. Gregory Buhyoff, another prominent researcher, is at the Forestry School in Virginia. In contrast to Britain where a strong cultural drive from its writers, poets and artists created a love for landscape, the impetus in the United States was far more political and events driven, such as proposals to flood pristine valleys or log stands of trees or propelled by men such as John Muir who generated love for the wilderness. It also derived from the strong outdoors culture of the nation as it evolved from being largely agricultural to being city based. By the turn of the twentieth century, the frontier had been tamed and the forests felled, and there was a growing appreciation of the outstanding aesthetic values of landscapes such as Yosemite, Yellowstone and the Grand Canyon. While scenic beauty undoubtedly was the major initial reason for the reservation of such areas, cultural and historic components and, later, ecological and biological factors were also considered. There has been no attempt, as in Britain, to evaluate even the landscape character of the United States, much less its landscape quality. Whereas much of the contemporary psychophysically-based research into human preferences for landscapes has been conducted in the US, almost entirely by academics, the findings do not appear to have been used in the applied sense to the measurement and mapping of landscape quality in that country. This is probably due to the division of powers and responsibilities between the Federal and State Governments. The Forest Service’s Scenery Management System, however, based on a different approach, is exemplary. Today Americans still feel that the creation of their many National Parks was their Best Idea. The appreciation of the Australian landscape was slow to develop. Initially settled largely with convicts from England and, later by people from various European countries, including some escaping religious persecution (e.g. Germans in Barossa Valley and Hahndorf in South Australia), the antipodean landscape was viewed with eyes used to the temperate climate and soft folds of the English or European lowlands. The survival imperative drove the exploitation until well into the twentieth century. The prevailing ethos was “if it moves, shoot it; if it doesn’t, cut it down; and if it’s lying still, dig it up”! Although early artists in Australia have been accused of transplanting English notions of the sublime, picturesque and Romantic to the Australian landscape (e.g. Flower, 1975), McLaughlin (1999) analyzed many early paintings and engravings of the Sydney region and found that although they often included features such as Aborigines or striking trees, palms and ferns in the foreground, they were generally accurate in their portrayal of the species and even portrayed the effect of fire on trees. She noted that the arrival of two established artists, Conrad Martens in 1835 and John Skinner Prout in 1840 introduced the picturesque and the Romantic “far more strongly in Australian landscape painting.” Some early artists, including Thomas Watling and William Westall, complained about the poor aesthetic quality of the Australian landscape as a subject for painting. “I believe the English are greatly deceived with the many flattering accounts respecting the beauty of the country and the fine salubrious air of South Australia” (Letters of Rachel Hemmings, 1854; quoted by Bird, 1989). These few quotes, drawn from hundreds from explorers, colonists and settlers writings, indicate that although there were many features of the Australian landscape which were unfamiliar, and often the opposite of their experience, nevertheless, there was an appreciation of its scenic qualities. Certainly, there was a prevalence of comments of the picturesque (i.e. that which would look good in a picture) and the Romantic view, the prevailing aesthetic models of the era, couched within the underlying utilitarian concern for the potential productivity of the land. A form of landscape that drew universal acclaim was the pastoral landscape, including James Cook’s description of the Illawarra region, “trees, quite free from underwood, appeared like plantations in a gentleman’s park,” Thomas Mitchell’s lauding of Fitzroy Downs of northern NSW: “the finest country I had ever seen in a primeval state. A Champaign region, spotted with wood…”, his Australian Felix of western Victoria with its stately trees and majestic mountains, and Ernest Giles’ description of Central Australia’s Rawlinson Ranges region: “The country down below, northwards, consisted of open, sandy, level, triodia ground, dotted with a few clumps of the desert oak, giving a most pleasing appearance to the eye.” It is hard to imagine a landscape more removed from the English pastoral scene. “Arcadian longings; a belief in the human task of civilizing and ordering the chaos of nature, economic necessity as well a moral responsibility; the nineteenth century’s interest in a scientific mode of observation; the need to establish a national identity differentiated from the country of origin; and romantic or neoclassical ideas and value-systems” (Bird, 1989). Massive change to the original Australian landscape ensued, with the ringbarking (i.e. cutting through the bark around the base of the tree which ultimately killed the tree) and felling of the forest trees, drainage of swamps, pushing through of roads and railways, and the building of towns and cities. Grazing by introduced stock as well as by feral pests such as rabbits removed the shrub layer and native grasses. Under Aboriginal occupation, fire was used regularly to open the vegetation and drive out game. With European settlement, fires were controlled, allowing the vegetation to recover and thicken, but fires often devastated the land and its inhabitants. In the late 1880’s, a century after settlement, the Heidelberg School of painting near Melbourne, produced a distinctively Australian ‘feel’ to the landscapes. In the short space of a few years, the en plein air style of painting produced by artists such as Charles Conder, Frederick McCubbin, Arthur Streeton and Walter Withers helped to transform the way in which Australians viewed their landscape. The Australian art historian, Bernard Smith, has remarked that the idealization of rural labor was a global phenomenon of the late nineteenth century and although by then most Australians lived in the cities, they identified themselves “with the life and attitudes of the Australian rural worker.” The “frontier exercised an enormous influence upon the imagination of all Australians” (Smith, 1971). Through art and the written word, the landscape and bush thus became an Australian icon, representing the best or the ideal, cloaked by the rose-tinted glasses of patriotism. That this re-conception of Australia was largely accomplished in the decade 1885 – 1895, is remarkable. “Am I glad to be home again? I cannot tell you how glad. The Australian landscape has always seemed to me the most beautiful in the world as well as the most mysterious. When I first saw the brown, hot earth from the ship’s deck at Fremantle I cannot tell you the emotion it gave me – after all that confounded sappy English Green” (Smith, 1971). With the beginning of the twentieth century, together with Federation of the nation in 1901, a new confidence became apparent. The national anthem, Advance Australia Fair, speaks of Australia’s landscapes: “Our land abounds in nature’s gifts, of beauty rich and rare.” The anthem was composed in 1878, was sung at the inauguration of Federation in 1901, and finally formally adopted in 1984. As in England and the United States, Australia initially established national parks to protect outstanding scenery and to provide areas for public enjoyment, with protection of flora and fauna a more recent motivation. The world’s second national park, Royal National Park, was established in Sydney in 1879, seven years after the first at Yellowstone in the United States. Unlike the English model, there are no nationally designated areas of outstanding beauty. However, many State and local government planning strategies provide for assessment of proposed developments that might degrade or impair the landscape (e.g. Haynes, 1975, O’Neil, 1975). Green areas are terrestrial protected areas, blue areas marine protected areas. Australia’s total protected area as contained in the National Reserve System (National and State reserves) conserving landscapes and biodiversity number 10,339 areas covering 531,000 sq miles (1,375,015 sq km) or nearly 18% of the Australian land mass (2014). Of this, National Parks at Commonwealth and State levels total 695 areas of 125,300 sq miles (324,420 sq km) or 4.2% of Australia. The system includes large Indigenous Protected Areas which total 212,500 sq miles (550,288 sq km) (7.2% of Australia). In addition, 413 marine protected areas total 1,265,600 sq miles (3,277,904 sq km), over twice the size of the terrestrial area. Figure 11 shows both the terrestrial and the marine protected areas. 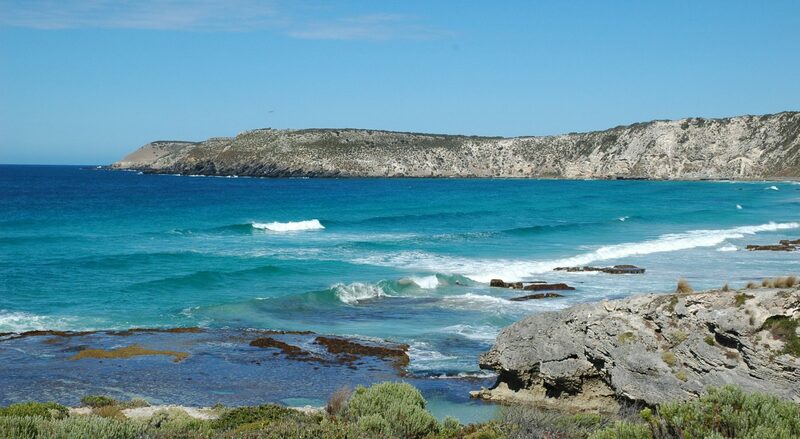 Nevertheless, there developed a distinctive love for the Australian landscape, evident in the popularity of tourism and recreation to experience it however remotely. There is an abundance of beautifully illustrated books, calendars, DVDs and films of the landscape, the extensive use of the landscape as iconic symbols in advertising. Many conflicts have occurred when forestry, mining, highways and other forms of ‘desecration’ of the landscape have been proposed. Until the 1970s, there had been no attempt to analyze the Australian landscape in an aesthetic or visual quality sense. Between 1972 and 1976, the National Trust in Victoria completed a list of 23 Classified and 26 Recorded landscapes. Concurrently, in 1975, the Australian Council of National Trusts decided that its State branches should undertake landscape classification on a standard basis. Led by the South Australian branch, three studies of landscapes were carried out between 1976 and 1982 (Kane, 1976; Dare, 1978; Revell, 1982). Despite, however, an immense amount of effort, largely by volunteers, to develop a method, the leader of the program, Maud McBriar, said, “…the ideal still eludes us” (Revell, 1982). Regardless of the lack of a satisfactory method, in the late 1970s, State branches of the National Trust nominated aesthetic areas for the Register of the National Estate, a Government-sponsored national program. The Australian Heritage Commission decided to defer the registration of such areas pending the determination of a methodology for classifying landscape quality. Nearly half the studies were for environmental management purposes, a further 24% were academic research and 12% for forestry VMS. Of the studies, 55% were physical descriptions, 27% were preference based, and 13% were experiential. The Community Preferences Method used in these studies is described here. To date, no other State has conducted such studies using community preferences. In 2003, the Australian Heritage Commission initiated the Inspirational Landscapes project to understand the qualities of outstanding natural landscapes that have inspired Australians, and thereby better assess their heritage value. Initially, 29 potential areas were identified, ranging in size from a small bay and a Botanic Garden to the vastness of Antarctica, the Murray Darling Basin, and the Simpson Desert. The indicators are being applied to guide the selection and assessment of inspirational landscapes. The project is the first national project to identify significant landscapes suitable for listing nationally. However, the criteria of Inspirational Landscapes lie outside the mainstream of features covered in landscape quality literature. The choice of the Inspirational Landscapes concept is somewhat curious and may prove to be rather narrow in terms of aesthetic response to landscapes. Alternatives could include: outstanding, symbolic, intrinsic, evocative, or simply high-quality landscapes. The Australian Heritage Commission has avoided the quantitative survey approach to visual aesthetics, preferring the experiential approach and a rather ad hoc identification of significant areas. In 2006, in a left-field initiative, Tourism Australia and Parks Australia partnered to designate superlative landscapes which provide distinctively Australian natural and cultural experiences as National Landscapes (Figure 12). The areas transcend State and regional boundaries and are major attractions for domestic and international visitors. The areas have or are proposed to have sustainable management arrangements, may provide iconic imagery and a capacity to cater for visitors without detrimental impact. The identification of areas appears to reflect the influence of the tourist industry to spread visitors as much as possible across Australia with sites in every State and Territory. Wet Tropics: Outstanding features of natural beauty and magnificent sweeping landscapes. The use of superlative adjectives appears to be pre-requisite for World Heritage nominations! Oddly, the two sites which did not include Criterion 7 were the Blue Mountains, probably Australia’s pre-eminent scenic landscape, and the forests of northern New South Wales, also an area of high aesthetic significance. Although the nominations refer to exceptional natural beauty, no survey of Australian landscapes at a national level has been carried out to substantiate these claims. Although vastly different in character from temperate English landscapes, many early explorers and writers appreciated the beauty of the Australian landscapes, particularly the pastoral-type landscapes. It took a century following settlement, however, before a distinctly Australian image of the landscape developed with the artists of the Heidelberg school and the bush balladeers. The World Heritage Convention was adopted in 1972 and provided for the conservation of cultural and natural sites. Natural heritage included: “natural sites or precisely delineated natural areas of outstanding universal value from the point of view of science, conservation or natural beauty” (emphasis added). The selection criteria for sites under the Convention includes Criterion 7: to contain superlative natural phenomena or areas of exceptional natural beauty and aesthetic importance (emphasis added). The International Union for the Conservation of Nature has a long-established Protected Areas Program under the World Commission on Protected Areas. Six categories of protected areas are defined including national parks, wilderness areas, and natural monuments (IUCN, 2000). Category 5 covers Protected Landscapes/Seascapes which are: “a protected area where the interaction of people and nature over time has produced an area of distinct character with significant, ecological, biological, cultural and scenic value” (emphasis added). Category 5 has particular application in Europe and protected its traditionally developed cultural landscapes. The European Landscape Convention (or Florence Convention), the first international convention applying to landscape, was adopted in 2000 and entered into force in 2004. The Convention covers all landscapes – natural through to urban, land as well as water, including marine, and degraded landscapes through to high quality land-scapes. It aims to protect, manage and plan landscapes as well as educate about them. It is hoped to make the landscape a mainstream political issue by putting it on the agenda of governments, planning authorities and the community. While European landscapes have been agricultural for centuries, the intensification of food and fiber production, producing more on less land through the use of fertilizers, pesticides, machinery and fossil fuels is resulting in greater landscape and ecological impacts (Mander, Palang & Ihse, 2004). Added to this the re-structuring of agriculture in the EU and the radical socio-economic changes in eastern and central Europe have additional impacts on the landscape (Mander & Jongman, 1998). The European Landscape Convention was initiated by the Council of Europe in 1994. Out of 47 possible signatory countries, 38 nations have ratified the Convention (2016), two have signed but not ratified, and seven have taken no action, including Austria, Germany and Russia. Denmark has excluded Greenland from the Convention. The Convention is seen to play an important role in the well-being of Europeans, empowering them to have a say in the protection and management of their landscapes. Being trans-European, it is intended to safeguard landscapes across borders. The emphasis is on landscape management rather than control. The preamble to the Convention speaks of landscape having an important role in social, cultural, environmental as well as economic fields, helping to create local cultures and a European identity. It contributes to the quality of life of individuals, whether comprising landscapes of outstanding beauty or everyday areas. European landscapes are regarded as a common resource requiring all to co-operate in their protection and management. The definition of landscape in the Convention is “an area, as perceived by people, whose character is the result of the action and interaction of natural and/or human factors.” Although this ignores its quality, it does recognize its subjectivity and the changing nature of landscapes over time, and it unifies natural and cultural elements. The objective for landscape quality involves “formulation of the aspirations” of the community regarding their landscapes and involves public authorities. Signatories are required to address landscape protection, management and planning, involve the public, and integrate landscape into planning policies as well as all relevant areas of public policy. Nations are to identify and assess their landscapes, analyze their characteristics and the pressures for change (Déjeant-Pons, 2006). Commencing in 2009, a Landscape Award is conferred every two years to authorities or NGOs who have taken steps to protect, manage or plan landscapes which are of lasting worth and provide models for others. The European Network of Regional and Local Authorities for the implementation of the European Landscape Convention (RECEP-ENELC) was established in 2006 to provide scientific, technical and political support to its members (recep-enelc.net/). The members are mainly from Spain and Italy. Specifically, what has been achieved under the auspices of the Convention is difficult to assess. The websites are full of meetings, workshops, seminars and conferences among those involved but what all of these have achieved is somewhat hidden. “from all governments that attention be given to the whole European landscape, urban and rural, terrestrial and marine, protected or degraded. This is a mighty ambition, allowing, quite properly, plenty of room for divergent interpretations” (Howard, 2004). “The Convention thus acts as a catalyst whereby these countries will be stimulated to rethink – through a process of coming together, gathering and meeting between differing interest groups, administrators and experts – what it is that is meant by landscape in their res publica (i.e. that which is known by and concerns everyone), and how this landscape can provide an overarching framework for both cultural and scientific policy. It is thus the practice of implementing the Convention that is important, not the letter of the Convention understood as if it were statutory law” (Olwig, 2007). In this theme we have traced how a national interest in landscape beauty has developed in several countries, Britain, United States and Australia and what each country has done to manage, protect and enhance it. National interest was initially strongest in Britain, and it has taken more steps at a national level to recognize and protect scenic quality than the other countries. Their approach has been pragmatic and effective, through the dedication of National Parks and Areas of Outstanding Natural Beauty, though in recent decades, they have focused on the classification of landscape character and have steadfastly avoided addressing landscape quality. Given their long history of writing, painting and extolling the beauty of their island nation, their failure to measure and map it is an opportunity waiting. By contrast, the United States, through their academics, knows more about how to measure landscape quality than any other nation (see Methods, and Findings of landscape quality research), but has failed to apply this knowledge at either a national or state level. Given their outstanding National Parks together with their recognition of Wilderness, Wild and Scenic Rivers, National Scenic Byways and the Forest Service’s Scenery Management System, it is high time that the country comprehensively tackled its national landscape quality. Australia has been a late comer in the landscape stakes, delaying recognition of its indigenous landscape until a century after settlement, but in more recent years failing at the national level to lead in its evaluation and protection. Addison Report, 1931. Report of the National Parks Committee. HMSO, Cmd. 3851. Appleton, J. 1975, The Experience of Landscape. John Wiley, London. Brace, C., 2003. Envisioning England: the visual in countryside writing in the 1930s and 1940s. Landscape Research, 28:4. Brancher, D.M., 1969. Critique of K.D. Fines: “Landscape evaluation, a research project in East Sussex.” Regional Studies, 3, 91-92. Cornish, V., 1934. The scenic amenity of Great Britain. Geography, 19:2, 195 – 202. Countryside Commission, 1987. Landscape Assessment, a Countryside Commission Approach. CCD 18. Countryside Commission, 1991. Environmental Assessment: The Treatment of Landscape and Countryside Recreation Issues. CCP326. Countryside Commission, 1993. Landscape Assessment Guidance, CCP 423. Countryside Agency and Scottish Natural Heritage, 1999. Interim Landscape Character Assessment Guidance. Countryside Agency and Scottish Natural Heritage, 2002. Landscape Character Assessment: Guidance for England and Scotland. Prepared by Carys Swanwick. Countryside Agency and Scottish Natural Heritage, 2002, Topic Paper 1: Recent Practice and the Evolution of Landscape Character Assessment. Prepared by Carys Swanwick. Dower, J., 1945. National Parks in England and Wales (Dower Report). HMSO, Cmd 6628. Fines, K.D., 1968. Landscape evaluation: a research project in East Sussex. Regional Studies, 2, 41 – 55. Hampshire County Council et al., 1968. East Hampshire Area of Outstanding Natural Beauty. Hobhouse Report, Ministry of Town & Country Planning, 1947. Report of the National Parks Committee (England and Wales), HMSO. Linton, D.L., 1968, The assessment of scenery as a natural resource. Scot. Geog. Mag., 84:3, 219 – 238. Lowenthal, D. & H.C. Prince, 1965. English landscape tastes. The Geog. Review, 55: 186 – 222. Minister of Town and Country Planning, 1949, National Parks and Access to the Countryside Act. Mosley, G., 1975. The English Experience. In: Australian Conservation Foundation, 1975. Landscape Conservation Rural Landscape Conservation with Particular Reference to the Rural-Urban Fringe. ACF Conference, 1975, Canberra. Research Box, Land Use Consultants & Rick Minter; 2009. Experiencing Landscapes: Capturing The Cultural Services and Experiential Qualities of Landscape. Natural England Commissioned Report NECR024. Robinson, D.G., I.C. Laurie, J.F. Wager & A.L. Traill, 1976. Landscape Evaluation, Report of the Landscape Evaluation Research Project, 1970-75 to the Countryside Commission for England and Wales. Centre for Urban and Regional Research, University of Manchester. Scott, A. & P. Shannon, 2007. Local landscape designations in Scotland: Opportunity or barrier to effective landscape management? Landscape & Urban Planning. 81:3, 257 – 269. Selman, P. & C. Swanwick, 2010. On the meaning of natural beauty in landscape legislation. Landscape Research, 35:1. Swanwick, C., 2002. Landscape Character Assessment Guidance for England and Scotland: Prepared for the Countryside Commission and Scottish Natural Heritage. Countryside Agency. Swanwick, C. 2004. The assessment of countryside and landscape character in England: an overview. In: Bishop, K. & A.Phillips (Eds), Countryside Planning: New Approaches to Management and Conservation. Earthscan, London. Younghusband, F., 1920. Address at the Anniversary Meeting, 31 May, 1920, Royal Geographical Society. Natural Beauty and Geographical Science. The Geog. Jnl., 56:1, 1 – 13. Warnock, S. & G. Griffiths, 2015. Landscape Characterisation: The Living Landscapes Approach in the UK. Landscape Research, 40:3, 261 – 278. Whyte, N., 2015. Senses of place, senses of time landscape history, British perspective. Landscape Research, 40:8, 925-938. Alsop, S., 1962. America the Ugly. Saturday Evening Post, 23 June. Beauty for America, 1965, Proceedings of the White House Conference on Natural Beauty. Washington, DC. Blake, P., 1964. God’s Own Junkyard: The Planned Deterioration of America’s Landscape. Holt, Rhinehart & Winston. Carr, E., 2016. Geniuses of the Place. Nature, 535, 7 July, 34 – 36. Daniel, T.C. 2001. Whither scenic beauty? Visual landscape quality assessment in the 21st century. Landscape and Urban Planning, 54, 267-281. Forest Service. 1974. National Forest Landscape Management: Vol. 2, Chap. 1: The Visual Management System. U.S. Department of Agriculture Handbook 462. Forest Service, 1995. Landscape Aesthetics, A Handbook for Scenery Management. US Dept. Ag. Handbook 701. Gobster, P.H., 1996. Forest Aesthetics, Biodiversity, and the Perceived Appropriateness of Ecosystem Management Practices. Gen. Tech Rep. PNW-GTR-369. Jackson, J.B., 1965. The Message on Natural Beauty. Landscape, 14:3, 1. Lowenthal, D., 1966. Geographical Record: North America. Geographical Review. 56, 115 – 119. Lowenthal D., 1968. The American Scene. Geographical Review. 58, 61-88. Sheppard, R.J., Beyond visual resource management: emerging theories of an ecological aesthetic and visible stewardship. In: Sheppard, R.J & R.S.J. Hawshaw (Eds), 2001. Forests and Landscape: Linking Ecology, Sustainability and Aesthetics. CAB eBooks. Walter, J.A., 1983. You’ll Love the Rockies. Landscape, 27:2, 43 – 47. Dare, R.J., 1978. A Landscape Study of the Fleurieu Peninsula, Stage One – The Inman, Hindmarsh, Back Valley Landscape Tract. National Trust of South Australia (South Australian Branch), Adelaide. Fabos, J. & A.M. McGregor, 1979. A Position Paper & Review of Methods for Assessment of Visual /Aesthetic Landscape Qualities: Report to the Australian Heritage Commission. Centre for Env. Studies, Uni. Melbourne. Heseltine, H.P., 1988. “Australian literature”, The Australian Encyclopedia, Australian Geographic. McLoughlin, L.C., 1999. Vegetation in the early landscape art of the Sydney region, Australia: accurate record or artistic licence? Landscape Research, 24:1, 24-47. Déjeant-Pons, M., 2006. The European Landscape Convention. Landscape Research, 31:4. Howard, P., 2004. Editorial: European landscape. Landscape Research, 29:4, 333-334. IUCN, 2000. Guidelines for Protected Area Management Categories. IUCN World Commission on Protected Areas. Mander, U., H. Palang & M. Ihse, 2004. Development of European landscapes. Landscape and Urban Plg., 67, 1–8. Mander, U. & Jongman R.G.H., 1998. Human impact on rural landscapes in central and northern Europe. Landscape & Urban Plg., 41:3-4, 149-153. Olwig, K.R., 2007. The practice of landscape ‘conventions’ and the just landscape: the case of the European Landscape Convention. Landscape Research, 32:5.